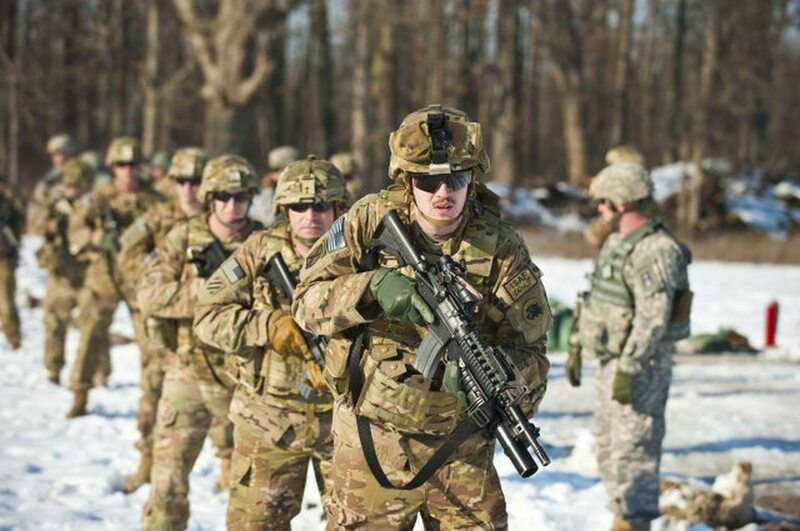 Army National Guard units will see more training days – up to 60 days a year in some cases – and combat training center rotations as part of the Army's effort to increase readiness across all three components and keep up with the demand for soldiers around the world. The increases in training days will not impact all Guard units. Instead, they will target certain high-demand units such as armored brigade combat teams and Stryker brigade combat teams, senior Army leaders said Wednesday on Capitol Hill. "Units that must be available immediately, such as Army National Guard ABCTs and Stryker BCTs, will have additional training days to enable their rotations through a combat training center," Lt. Gen. Joseph Anderson, the deputy chief of staff for operations (G-3) wrote in his written statement to lawmakers on the House Armed Services Committee's readiness sub-committee. This training will take place over a four-year cycle, Anderson said. During a unit’s first year in the cycle, soldiers will train for 39 days, which is the standard now and consists of one weekend a month and two weeks a year. The training days will increase to 45 days during the second year, and 60 days each in the third and fourth years, Anderson said. The intent would be for the unit to complete a combat training center rotation during the third year. "This is a tremendous increase in time to get them ready," he said. "It will increase the CTC rotations for the Guard from two to four starting in [fiscal 2018]." The move to up Guard training comes as the Army continues to struggle with readiness across the force. Only about one third of the Army’s brigade combat teams, one quarter of its combat aviation brigades, and half of its division headquarters are ready to deploy if needed, Anderson said in his written statement. "Last month, our Vice Chief of Staff [Gen. Dan Allyn] testified that only three of those BCTs require no additional people, no additional training and no additional equipment," Anderson’s statement said. "Since then, we are now down to only two BCTs being ready to fight tonight without receiving additional people, training or equipment." All this as the Army continues to deploy thousands of soldiers to Iraq, Afghanistan, Europe, the Pacific, Africa and numerous other places around the world. With "adequate levels of predictable funding and stable demand," the Army should reach "sufficient" readiness in its current force by 2021 or 2023, Anderson said. A key component to restoring readiness is rotations at the Army’s combat training centers. In 2016, the Army ran 18 rotations at the National Training Center at Fort Irwin, California; the Joint Readiness Training Center at Fort Polk, Louisiana; and the Joint Multinational Readiness Center in Hohenfels, Germany. It plans to run 19 this year, and there are plans to increase the rotations to 20 in 2020, Anderson said. "We have prioritized getting units back through the combat training centers despite budgetary pressures," he said. The Army also is growing this year, adding 28,000 soldiers to its ranks as outlined in the 2017 defense authorization act. About 16,000 of those soldiers will go to the active Army, bringing the component’s end strength to 476,000 by Sept. 30. Anderson – who testified Wednesday alongside Lt. Gen. Aundre Piggee, the deputy chief of staff for logistics (G-4), and Lt. Gen. Gwen Bingham, the assistant chief of staff for installation management – said the additional soldiers will first be put in undermanned units across the Army. "Commanders today, in many cases, struggle to meet readiness objectives because they do not have enough soldiers present for duty," Anderson said. "We will fill these gaps to prevent the development of a hollow force." In addition to adding soldiers and increasing training days for the Guard, the Army also is building more "critical unit types," Anderson said. This includes converting an infantry brigade combat team into an armored BCT, formations that are in high demand for deployments to Kuwait, South Korea and Europe. The move will give the Army 15 armored BCTs in the active Army and Army National Guard, Anderson said. Given additional resources, "we would pursue a 16th ABCT," he added. "We are facing evolving threats," and budget constraints have placed further stress on the Army, Anderson said. "Readiness for ground combat will remain the Army's first priority."